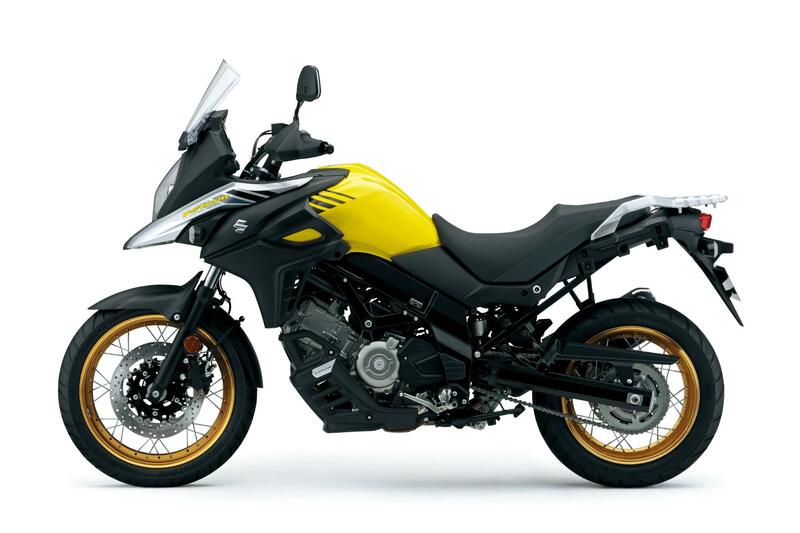 Suzuki officially launched V-Strom 650XT ABS at Rs. 7.46 lakh (Ex-Showroom, Delhi). Globally, the V-Strom 650 is available in two variants – Standard and XT, which is focused towards off-roading. To keep the pricing on the affordable side, Suzuki decided to assemble the V-Strom 650XT in India. 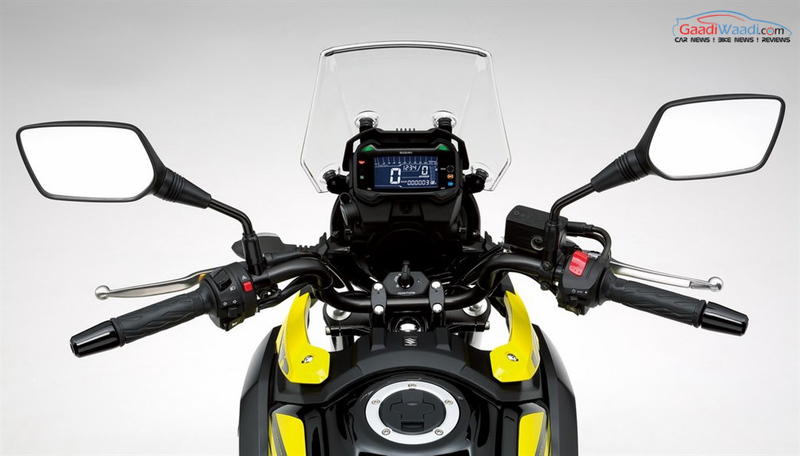 The V-Strom 650XT follows the same design language of its big brother V-Strom 1000. The vertical headlamp setup with new semi-fairing gives a unique look for the V-Strom. Suzuki has given large 20 litres of fuel tank along with good efficiency will give an excellent range for the adventure bike. The instrument cluster get analogue RPM meter and all other information including speedometer, odometer, fuel level, coolant temperature, gear position, battery voltage and traction-control modes are displayed on the dual LCD screens. The bikes also come with a 12V DC outlet as a standard feature, which will help the rider to charge mobile phones easily. The 645 cc liquid-cooled V-twin engine produces 71 PS of power at 8,800 rpm and 62.3 Nm of torque at 6,500 rpm. This engine is mated to a 6-speed gearbox. The adventure bike comes with lots of safety features like lightweight Anti-lock Brake System (ABS) and three-mode traction control system, which can be turned off also. The braking duties are handled by Tokico 2-piston callipers with 310 mm disc at front and 260 mm Nissin disc brake at the rear. 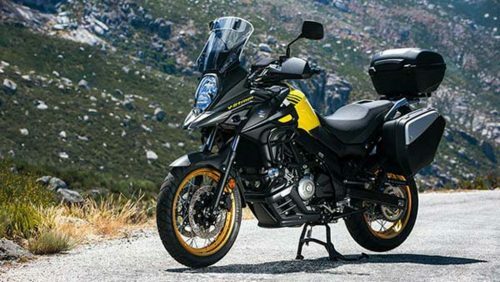 The V-Strom 650XT ABS gets aluminium rims with stainless steel wire spokes and the company has given 110/80-R19 wheel at the front and 150/70-R17 wheel at the rear. Suzuki has given tubeless Bridgestone Battlax Adventure tyres, which offers good grip during off-road and on-road. 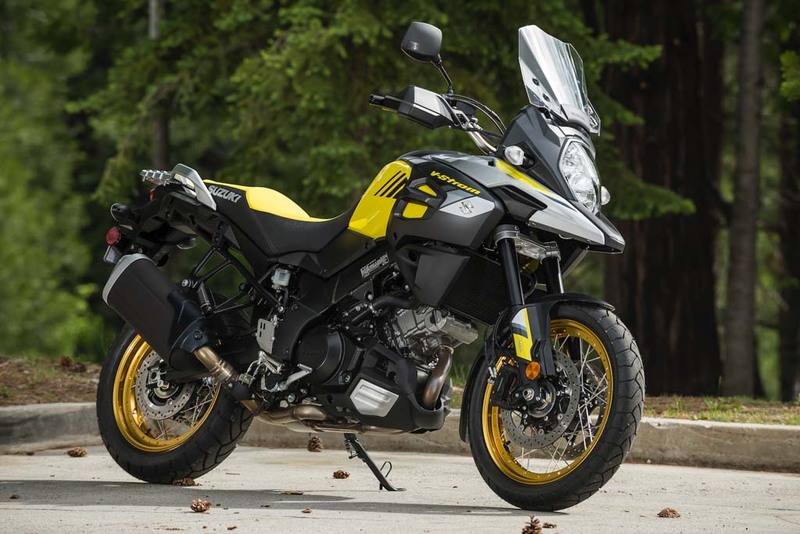 The V-Strom 650 comes with 43 mm telescopic forks at front with 150 mm of travel and adjustable mono shocks at the rear. The adventure bike is available in two colours – Champion Yellow and Pearl Glacier White.